This is an interview with Lars Perkins, as he talks about his new app and the new features in the works! Relive is a smart photo-sharing app that allows users to easily share photos privately, amongst close friends and family. Founded by Larks Perkins, a serial entrepreneur, filmmaker, inventor and avid photographer, Relive hopes to solve the problem of privacy in the social photo sharing space. Perkins is not new to the photo startup industry. He is the founder and CEO of the popular photo platform, Picasa, an award winning software for digital photography users, that took the pain out of finding photos stored on a computer hard drive. In 2004, Perkins had a successful exit and sold Picasa to Google. Perkins came up with the idea of Relive from his own personal pain of not wanting to share photos of his kids to a public feed such as Facebook, Twitter or even Instagram. Using Relive, parents will finally be able to share personal photos of their children to their close friends and family with ease and feeling of security that it is not going out publicly to strangers. 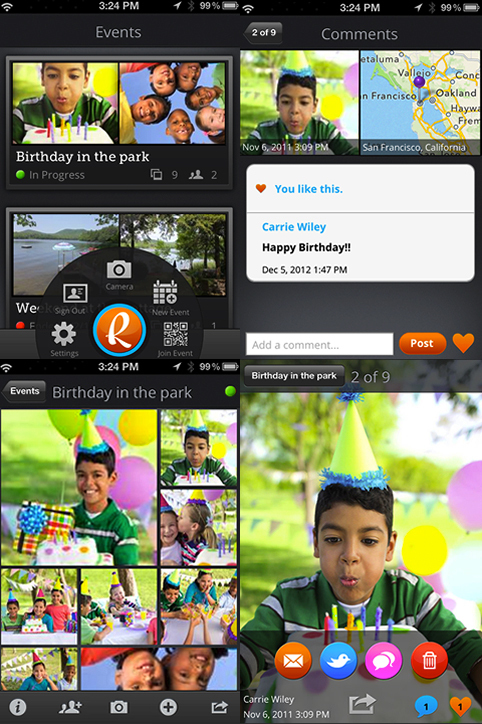 Relive makes it easier to share photos in events such as weddings, conferences, birthday parties and vacations. You can invite people to join the event you created to view your pictures or join in sharing their own pictures from that event. When guests arrive at an event, they can open the app and it will automatically detect the event created. Guests can easily click to join in and start adding their own pictures. Relive is also a great way to meet new people, sharing pictures in real time in the events you’re attending. Relive is available on iPhone, Ipad, Android and Windows 8. To download the app, visit Relive.